Homemade miniature milling table fabricated from aluminum. Work pieces are clamped to the 1/2" thick table through T-slots cut into the table's surface. 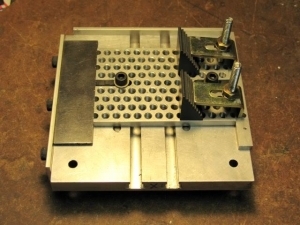 A perforated tooling plate with tapped holes can be mounted on top of the table to provide additional clamping possibilities in any location.